In the nine months since Hamas fought a 50-day war with Israel, the terrorist group has exploited the months of recent quiet to prepare itself for the next clash, which it assumes will inevitably come. Hamas is in the midst of a full-scale rocket rearmament and tunnel reconstruction drive. The Israel Defense Forces (IDF) is also preparing its responses for the next time the Gazan regime attacks. Despite its extremist ideology, Hamas does not appear interested in sparking another costly and damaging war now, and yet, a large number of potential triggers are in place that could start one anyway. The military wing, the Izzadin Al-Qassam Brigades, has restarted its domestic rocket and mortar production program, and built, in all likelihood, more than 1,000 rockets since the Aug. 26 ceasefire went into effect. The new rockets include dozens of projectiles with a range of more than 75 kilometers, putting central Israeli cities in reach. By the end of Operation Protective Edge last year, Hamas was left with about 3,000 rockets – a third of its original stockpile. Israel's Iron Dome anti-rocket batteries proved more than capable of shooting down volleys of incoming Gazan rockets that threatened populated areas in the last conflict, intercepting 580 incoming threats. Despite Israel's effective air defenses, Hamas is pushing to produce more rockets, since they still have the ability to disrupt Israeli civilian life with air raid sirens, force millions to take cover, and harm Israel's economy. Due to Egypt's stringent policy of destroying smuggling tunnels, Hamas is not able to smuggle weapons in from outside, and uses metal workshops in Gaza to make rocket tubes and fins instead. It uses dual use materials like farming chemicals and mixes them together to create explosive warheads. The IDF destroyed 32 cross-border attack tunnels last summer, which Hamas dug with the intention of injecting murder squads into southern Israel to kill and kidnap Israelis civilians and soldiers. Hamas had employed around 1,000 diggers at relatively low cost, and worked them in shifts to create the underground network. It linked the cross-border tunnels to a series of subterranean passages within Gaza itself. Such tunnels were used for the transport of arms and terrorists, out of view of Israel's air force and intelligence services. Should a new Hamas tunnel be found to cross the border into Israel again, violating Israeli sovereignty, another round of fighting could soon follow. Meanwhile, the Gazan economy remains stagnant. A small percentage of the $5.4 billion pledged by international donors towards Gaza's reconstruction has reached the Strip. The hold-up in transferring the funds is rooted in an ongoing dispute between Gaza's rulers and the Ramallah-based Palestinian Authority (PA), which governs Palestinians in the West Bank. A failure by the PA and Hamas to agree to a joint mechanism to receive the funds means that reconstruction is proceeding slower than a snail's pace. Tens of thousands of Gazan buildings that were damaged or destroyed in the 2014 conflict remain unrepaired. Hamas, for its part, uses the resources it does have to rebuild its offensive military assets, largely ignoring the plight of Gazan civilians. The longer reconstruction is held up, the more the chances of a renewed conflict grow. Israel, being well aware of this possibility, is making efforts to facilitate the entry of reconstruction material. In April alone, according to figures from the IDF's Coordinator of Government Activities in the Territories, 63,468 tons of construction materials entered Gaza via Israeli crossings. Since October, 167,673 tons of construction material entered Gaza. Gazan civilian pressure on Hamas could grow, and the military wing could find an excuse to initiate a new conflict: to force the international community to facilitate reconstruction. Such a move would be designed to deflect domestic pressure away from Hamas. When Hamas initiated war with Israel last June, it did so because Hamas leaders felt regionally barricaded, and their regime was on the brink of economic collapse. Hamas hoped that a conflict would to strengthen its position, and used its military bases, hidden in the heart of residential areas, to attack Israel regardless of the suffering this decision ended up causing to the residents of Gaza. Today, all of the same factors that caused Hamas to turn towards conflict remain in place. To the south, in Egypt, Hamas's sister movement, the Egyptian Muslim Brotherhood, is hunted and repressed by the government of President Abdel Fattah el-Sisi, contributing to Hamas's isolation. Egypt views Gaza as one large terrorist base, where Salafi-jihadist organizations freely arm themselves and move through tunnels into Egyptian territory to carry out attacks. Egypt identifies Hamas a branch of its Islamist domestic foe, the Muslim Brotherhood, and a direct threat to its national security, leading to a ban on the military wing this year. Egypt created a kilometer-wide buffer zone with Gaza, destroying homes on the Sinai-Gaza border, and blocking off hundreds of smuggling tunnels in the process. Hamas has few regional allies, though it does enjoy some backing from Turkey, Qatar, and an old-new friend has reappeared: Iran. Hamas and Tehran reestablished ties this year despite mutual mistrust, and Iran started bankrolling Hamas's rearmament program to the tune of tens of millions of dollars. In addition, tensions exist between various ruling factions within Hamas, a fact that could lead to future instability. 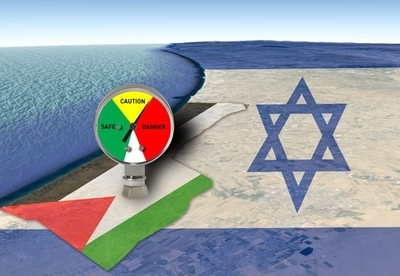 Disagreement exists between Hamas's military wing and the political wing in Gaza. The military wing is privately disappointed by the performance of the political wing during last summer's war, and feels aggrieved over a perceived lack of support. The political wing, has, behind closed doors, questioned the military wing's 'achievements' during the war. The emergence of ISIS-inspired groups in Gaza creates another potential trigger for destabilization. Hamas recently arrested dozens of hardline Salafi jihadists in Gaza who pose a threat to its regime, and destroyed a mosque at the start of May belonging to a pro-ISIS group. Such groups accuse Hamas of being too soft on Israel, and have sporadically fired rockets at Israel, prompting Israeli retribution strikes as well as Hamas arrest raids. Despite the tension, Hamas is likely to maintain links with global jihad organizations operating in the Sinai Peninsula. These ties might enable Hamas to reserve the option of ordering attacks on Israel, away from its home turf of Gaza. Hamas can be expected to try to set up terrorist infrastructure to activate at a later time in other areas too, particularly in the West Bank, and in southern Lebanon. Ultimately, as long as Hamas refuses to recognize Israel and drop its openly declared goal of destroying it through a jihadist war punctuated by temporary ceasefires, it will continue to pose a significant risk to Israeli security, and an even larger risk to the civilian population of Gaza over which it rules. They are locked into a war mentality. All they have been trained in and know is hate. Their reactions are predictable. Fortunately the Israelies know that too. As the single country in the Middle east in which there is respect for freedom and individual rights, Israel is morally entitled to use whatever means necessary, political, diplomatic, and above all, military, to survive and prosper. Israel and its citizens should take whatever actions are necessary to eliminate Hamas as a threat to their country.